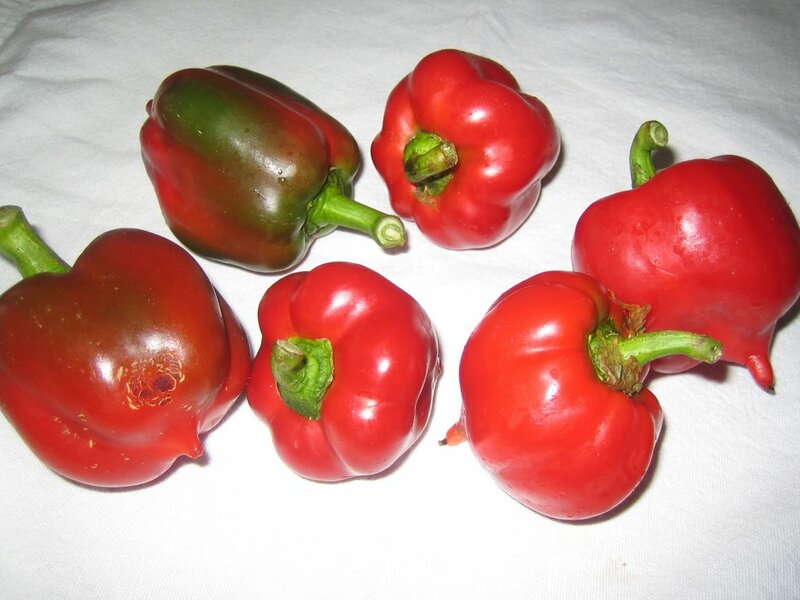 Look at these adorable red peppers. Organic. Not perfect, small with some blemishes... not big honkin' peppers with thick skins. This is just one of the reasons I love buying organic. Now, I am not an organic elitist. I don't buy everything organic. Some things are ridiculously expensive organic, especially at certain times of the year (ex: ginger, asparagus). BUT... I do buy organic wherever possible, and there are some fruits and veg I NEVER buy conventionally grown (ex: strawberries... read on). Organic usually tastes better. Taste test with a conventional apple or banana against organic ones - you'll agree. Also, there is the whole element of support organic agriculture, it's better for our land, supporting local organic farmers... which I won't expand on here. What I will talk more about is the health aspect, and some fruits and veggies are more heavily treated with pesticides. As I mention in Vive, these pesticide residues are particularly dangerous for our babies and children, since their little bodies are still developing. So, which fruit and veg have the highest pesticide residues? Strawberries, apples, bell peppers and spinach are a few of the "dirty dozen". For a more complete listing, click here. You can print out a wallet guide on this site, and read more on pesticides. Some of the 'safer' produce? - Pineapple, mangoes, asparagus, and avocados to start. I started to buy more and more organic fruit and vegs lately, especially because I read you should buy organic for things you eat everyday. I eat an apple everyday before or after the gym so I started buying organic ones and they definitely do taste better. Pineapple, mangoes, asparagus, and avocados...a food group of their own! Some of my faves!!! Energy Times has a few nice articles this month re: organic foods! I just got mine in the mail today! This is a great education for some people. Thanks for sharing. I totally agree with you about how weird it is to have humungus fruits/veggies when they aren't supposed to be that big. I didn't know about strawberries being that bad, but I, like you, buy organic whenever possible. Great information - wonderful resource. Ideally, we try to buy organic, local produce. It's fresher because it doesn't need to be transported as far -- using less resources & supports local farmers. This Spring, we are keeping our own organic garden -- can't get much more local than that! LOL! I really enjoy your blog. Thanks for the link Dreena. The little pocket guide is quite handy. Yes, for organic produce and farming! Thanks for posting this, Dreena. >>these pesticide residues are particularly dangerous for our babies and children, since their little bodies are still developing. My oldest (8) always ask before devouring a fruit if it is organic. When she's offered a fruit by other people, she just kindly refuses and I think she does this knowing that it's likely a "conventional" one. They catch on really quick. Emily, that's a good rule of thumb, because you certainly are reducing your exposure to pesticides with the things you eat day to day. Great tip, thanks! Energy Times? That's a new one for me, Harmonia - I'll have to look that up, thanks! Hi Leslie, yeah strawberries, cherries and raspberries - all part of the 'dirty dozen', unfortunately - but blueberries don't seem to be. I LOVE berry season, and miss it so much when it's over, because then I'm buying organic frozen until the next season starts! Hi dreamqueen (pesticide-be-gone... cheeky you!) :) Yeah, some things are very hard to wash like strawberries, raspberries, spinach - others are easier, but then I've read that it gets in under the skin too, which is troubling. As I said, I don't buy everything organic, but I will do without certain things like fresh strawberries until I can get them organic (and at a reasonable price)! Welcome back, Kai... hope you had a nice blog-break! :) Wow, smart kidlet, and also such social graces, not making the situation awkward by asking "um, is it organic?" Awesome! I agree, they get it quickly, I already see my older daughter understanding so much about food! I agree -- organic produce does taste better! I like your peppers with the little "tails!" Another reason to buy organic is to avoid GM (genetically modified) food. Pretty much all non-organic corn is now genetically modified, and soybeans are on the way too, and I've recently read that tomatoes aren't far behind. Modern industrial agribusiness practices are scary...one just needs to do a few google searches on GMO foods and decide for oneself. To me, it's a bigger issue even than pesticides. And considering how many places corn shows up, especially as sweetener, and soy, as soy lecithin, it seems so hard to avoid. Check the tag; if it's a four-digit number, it's conventional. If it's a five-digit number beginning with "9," it's organic. Catherine, I have read that too about the nutritional benefits - I figure it has to be healthier by the mere fact that our bodies don't have to try and rid any pesticides. I know, aren't those peppers just plain cute??!! Amy, I'm glad you brought that up, because I didn't and you're bang-on. I don't like buying soy unless it's organic, for that very reason. And often some of the genetic modifying involved genes of animals, for the very purist vegans, this would be offensive to them I'm sure. And yes, corn and soy products find their way into most processed foods. Danielle - what an excellent tip! Thanks... I never knew that! Organic *does* taste better! When I first started buying organic, I didn't know about this benefit and was startled to come to the realization on my own that it was true! Yum. If the number is 8 it's conventional. If the number is 9, it's organic (like Danielle said). If it is a weird number like 6 or something then it has also been genetically modified, YUCK! I couldn't help myself...I had to post a part 2 to Midweek Munchies. I have new questions posted too! Incase you have any ideas! Dreena, this is a wonderful posting, I'm really glad you made it. I've been buying organic for a few years not, my mom actually got me into it in my teenage years. I really believe they are not only better for the world but healthier for individuals as well. I printed out this guide for my wallet, and there's one on my wall at work - I'm fairly familar with the list but it feels good to have it on me. Another reason I don't really like dining out is hmm where did this produce come from?? Fortunately in Portland I dine at places that tend to use local produce, but I worry about it elsewhere, it feels dirty! Hi Elizabeth - yes, and certain produce you can *really* notice the taste difference! Thanks for that, Leslie... I wonder if it's the same here in Canada? I'll have to check it out on my next shop. Oh, Jess, funny that you mention that about eating at restaurants. Sometimes, if I'm eating a stir-fry or something with a lot of peppers or spinach, I think "hmm, is this all pesticide laden and not even washed"! But, I've tried to 'relax' a little, or I'll never be able to eat at ANY restaurants!! :) How truly awesome that your mom got you into organic foods... tell her she is a cool mama! Eatpeaceplease--the number 8 means genetically modified. If it's conventional,it's just four digits. Thanks for the clarification, Danielle! Oh, yuck, Nancy... that's an image that brings it home for you, and yes, convince you to buy as much organic as you can.